It has to be one of the humblest of all confections. 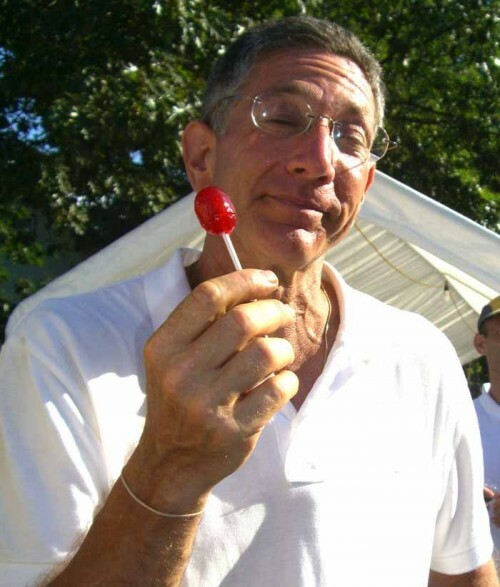 The lollipop is simply a small piece of hard flavored candy on top of a stick. With absolutely no nutritional value. Its sole purpose is to offer a modest measure of sweet joy to the consumer and perhaps allow them some brief time to enjoy its diminishing glistening sweetness in their hand as it is slowly licked into oblivion. For Guinness champion Ashrita Furman, who has often taken on simple child like pleasures and escalated them into herculean accomplishments the task of constructing the world’s biggest lollipop seemed like a worthy challenge. On the anniversary of his spiritual teacher’s birthday he has often turned to creating extraordinary sweet treats to honor him. In what would have been Sri Chinmoy’s 77th birthday last August 27th he and a large group of students created a birthday cake with 47,000 lighted candles.